Limescale is caused from excessive minerals in hard water. If you live in an area with hard water, you'll likely notice a whitish, difficult-to-remove crust around your faucets and sinks. This is limescale buildup. Limescale not only builds up on sinks and faucets but also inside of your dishwasher where ample water is running through. A buildup of limescale in your dishwasher is not only unsightly, it can also leave a cloudy film on your dishes. Delime your dishwasher when you begin to notice this film and buildup to keep your dishes and your dishwasher clean and limescale-free. 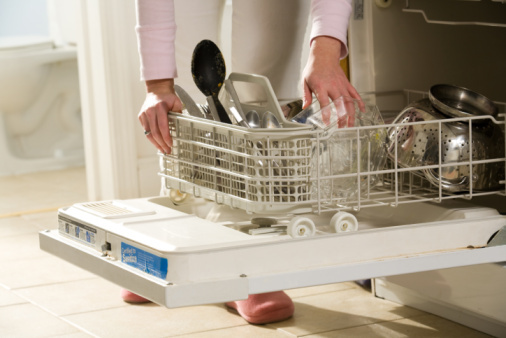 Delime your dishwasher to reduce residue on your dishes. Empty out the dishwasher so it's free of any dishes. Take out the racks and utensil holders. Pour 2 cups of white vinegar into the bottom of the dishwasher. Turn the machine on to the lowest or shortest wash setting. Stop the dishwasher in the middle of the wash cycle. Let it sit for about 20 minutes so the vinegar can break through the buildup. Turn the machine back on and allow the cycle to finish. Wipe out the inside of the dishwasher with a dry rag to remove any loosened grime or residue.